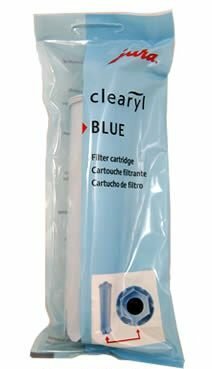 Pack of FIVE Clearyl Blue #67879 filters for your Jura Capresso Impressa New Z7, J6, Ena 3, Ena 4, Ena 5 and new C5 and C9 OneTouch: This the Clearyl 60 Filter Model #67879 (now known as as "Clearyl Blue") water filter cartridge for JURA CAPRESSO IMPRESSA Automatic Coffee Centers New Z7, J6, Ena 3, Ena 4, Ena 5 and new C5 and C9 OneTouch with blue water tank (not earlier models). NB Other Jura models take the Clearyl White 64553. Some take the 7520 or the 7525. Check your manual before ordering. Without the use of chemical additives, the Clearyl water filters reduce water hardness up to 75% and remove impurities, such as chlorine and calcium carbonate, from your water supply (minerals and fluorides important for health remain in the water.). The filters not only protect your Jura-Capresso machine, but also improve the taste of the water, and thus your espresso. Your Jura coffee center will alert you when it is time to replace the filter. The general rule of thumb is to replace the filter after 60 liters (about 14 gallons) of use. The filter cartridge is placed directly in the water tank and requires no accessories or additional space. After inserting the filter for the first time you must activate the filter program - see instruction manual for details. Avoids the need to decalcify the machine. It is not necessary to use a filter if you have a filtered water system or use bottled water. Please be sure to order the correct filter for your machine. We cannot refund filters that are not in their original sealed packaging. Refunds are processed after deducting the original packing and postage costs we incurred. If products have to be exchanged we can only do so if customers are willing to pay shipping for the items supplied in exchange.